Depending on the type of GatherKudos page, this could be a star rating, thumbs up or thumbs down, smiley or frowny face, etc. You can include the owner's cell phone and have it email directly. This empowers you to get useful feedback about your frontline staff, make improvements to your business, and prevent negative reviews online. We can display links to any review site. 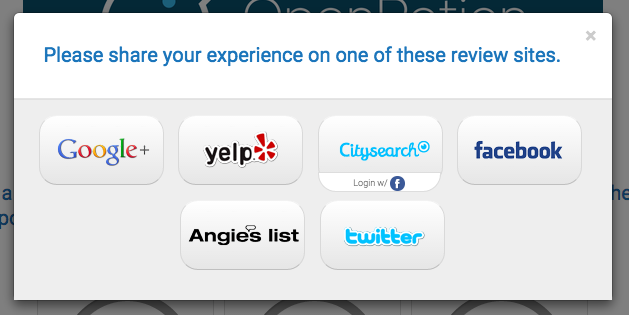 They can pick any review site that they already feel comfortable or familiar with. This helps review diversity (a local SEO ranking factor). Most people don't leave reviews because they find it difficult or confusing. GatherKudos shows them and tells them how to leave a review. ...and You Get More Good Reviews. 1. Get Your GatherKudos URL / Link. We can have it setup in just 1 business day. Put it anywhere your customer can see. Don't worry, ask for the good and the bad. Resolve things, improve processes, or fire people. 5. Get More Happy Reviews on Yelp, Google, Etc. 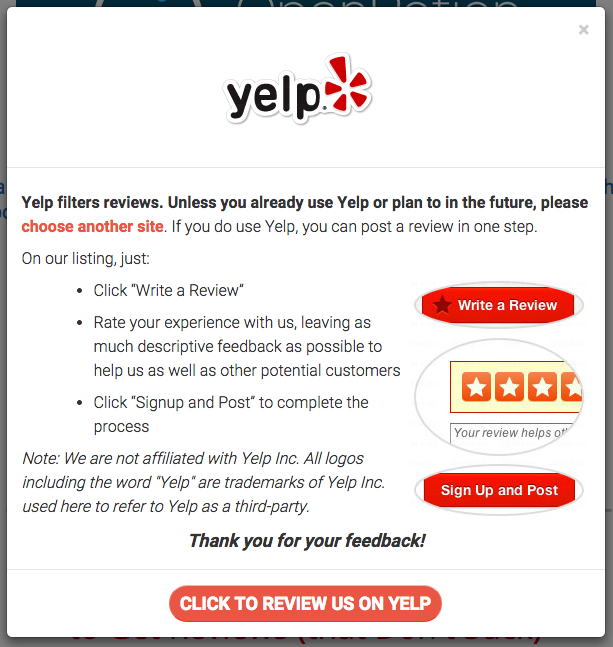 Happy users pick a favorite site, get simple directions, & leave a review. Where Can You Use Your GatherKudos URL? Fearlessly place it anywhere your client can see, and just ask for any feedback - both good AND BAD. Just hand these bad boys out to your happy clients and they will remember to leave you a good review. We Know Business Owners Are Busy. We Take Care of Everything: Page Setup, Hosting, Support, Changes, Etc. Start implementing a solid review strategy today. Don't wait until you have a few bad reviews to take your reputation seriously. Get signed up and you can start improving your reputation today. 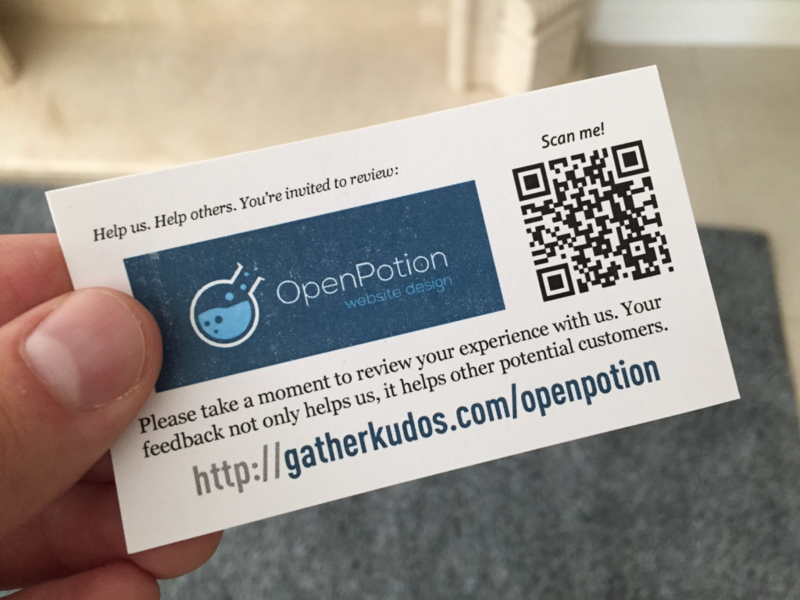 Using GatherKudos has allowed my firm to receive feedback from clients and tenants in order to improve our customer service. It has also allowed us to enjoy the kind reviews of our customers. This is an effective tool that any business can benefit from using. "A systematic approach for getting reviews"
"This has given our business a systematic approach for getting reviews, and screening bad ones. I think it makes it easier for the customer to leave a review." & to eliminate risk... we are offering your money back if you aren't 100% satisfied. Ready to start taking control of your reputation?